Description Industrial with a downtown edge take home this forever chic Italian Abstract Printed Stretch Cotton Twill. 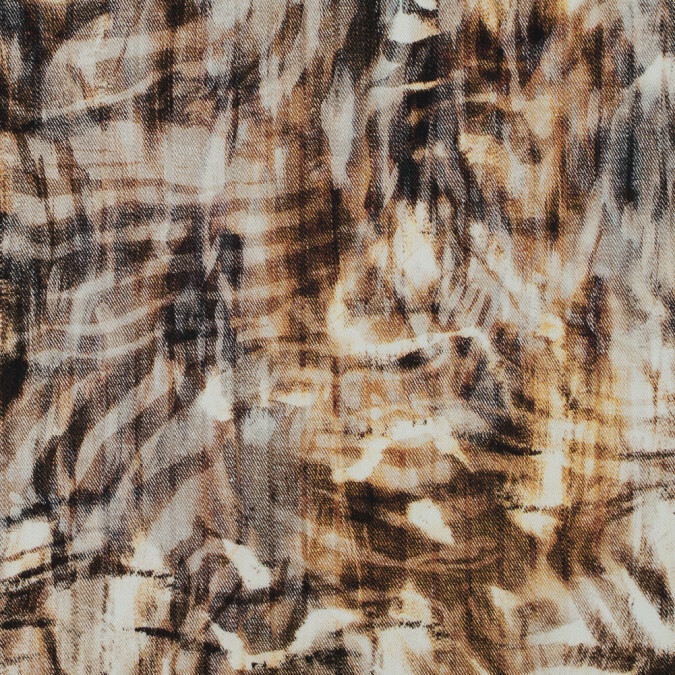 A crisp hand presents a distressed pattern of brown and white creating a marbled grungy look. With an effortlessly cool aesthetic akin to Helmut Lang create pants and classic denim-style jackets for a model-off-duty style. Although it has a stiffer drape fear not as it is equipped with a stretch through the weft! Garments will stretch and fit to your active lifestyle whether you are running errands or through the streets of Soho. Thin and lightweight it is very slightly translucent allowing a lining to be optional. Note that this fabric may be machine washed in waters no higher than 40 degrees Celsius. Do not bleach or tumble dry this fabric. It may be ironed in temperatures no higher than 230 degrees Fahrenheit. You can use any solvent for dry cleaning except tetrachloroethylene.